Materials: 14K white gold, a 0.236 x 0.118 inch (6x3 mm) marquise-cut amethyst set in a 14K yellow gold bezel in the ladies' ring. 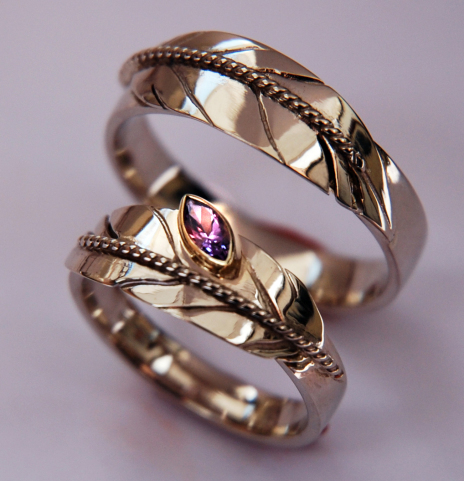 SCROLL DOWN to read about the symbolism of these wedding rings, or go to our art blog. Color, shape, and asymmetric placement of the sparkling amethyst cradled in a 14K yellow gold bezel in the ladies’ ring create a touch of refinement and magic wonder; elements that I always seek to incorporate into my ring designs. Amethyst is said to be a meditative and calming stone that provides calm, balance, patience, and instills peace in mind, body, and soul. In addition to the eagle/Thunderbird feather symbol, the marquise cut shape of the 0.236 x 0.118 inch stone that I placed off-center on one side of the feather represents an “ashkibag” (spring leaf) that sprouts spontaneously from a stem of a plant or tree. It is a playful reference to the spring season, time of rebirth and new growth.